One of my favorite comfort foods is a slow roasted chicken. It is easy to prepare, makes your home smell heavenly, and usually provides leftovers for another meal. Once you’ve picked the chicken off the bones, save them! They can be kept in the refrigerator for about a week or frozen if you can’t get to them right away. While you are at it, save your veggie scraps–carrot peelings, ends from celery, mushrooms, and onions, even kale stems–to use in your stock as well. In the notes section, I mention using cheesecloth when straining the stock. My new favorite option to cheesecloth is an old (clean) t-shirt. I cut the back and sides off to get the biggest square possible and line the strainer with this. You can squeeze out every last drop of stock, discard the contents, wash and use again. It works beautifully! leftover ends of other veggies, if desired, such as leeks, mushrooms, kale stems, etc. Put all of the above ingredients in a very large, heavy-bottomed pot. Cover with water, bring to a boil, and immediately reduce heat to low. Keep at barely a simmer (uncovered) for three hours. The stock will be better if you do not keep it at a rolling boil. Add water as necessary to cover the bones and vegetables. After three hours, remove from heat and allow to cool to a point that the stock won’t burn you. Pour through a fine-mesh strainer (see notes) into another large pot and cool completely in the refrigerator. Any fat will rise to the top once cooled and may be easily skimmed off the surface before transferring to containers for storage. If you do not have a fine-mesh strainer, simply line your strainer/colander with cheese cloth. Then you can squeeze the cheese cloth to extract every last bit of stock. I also have someone hold the strainer so it doesn’t slip. I like to freeze in quart or pint-size deli containers. Freezer bags also work well and can be frozen flat and thawed quickly. The bags with the stand-up bottom will make getting the stock in much easier. Date the containers and mark the amount of stock (i.e., one cup, two cups) so you can thaw the amount you need for any given recipe. Pingback: The Fountain Avenue Kitchen – Slow Cooker Turkey Breast and Gravy — great way to make extra leftovers, too! Never made stock before but after seeing your recipe I thought I can do this! Was really easy to make and very tasty. Question though: I belong to a CSA, can I keep the stalks of Kale, collards, leeks etc in the freezer and when I ready to make stock throw them in? I only had the basics in regards to vegetables this time. I roast a chicken every week and I hope to make stock at least every other week. Yes, Christie, you can absolutely freeze the veggie odds and ends until you are ready. It works beautifully. I am so glad you tried this and enjoyed!! Do you cook covered or uncovered? Made your slow roasted chicken – delicious! Great question, Linda. I leave the pot uncovered…and I’m thrilled you liked the chicken! The picture of the vegetables soaking really caught my eye. I made a few adjustment (being Vegan) but it still turned out delicious and was so easy to make. I wish that I had know that it was this easy to make at home instead of buying it in the store at outrages prices. Thank you so much for posting. So happy you found this as an economical and great-tasting option to store-bought, Carol. Thanks for your comment! 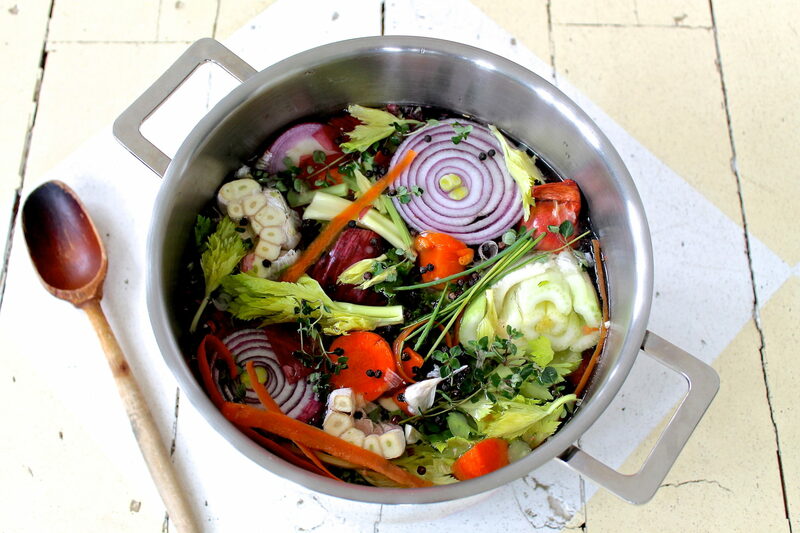 I tried this stock recipe and it’s great…I also did the slow cook chicken which was the best I have ever cooked. I did think it would dry with being in the stove for so long but it was so juicy and moist. This is the way to go from now. I’m delighted you made both and that they’re keepers. Thanks for the great feedback, Lynda!